Public Service Announcement - Glow Recipe is now available in Canada at Sephora! Finally! I have been waiting for Glow Recipe to come to Canada for what feels like forever! Glow Recipe is a brand that focuses on merging the best of Korean beauty products with the quick results and uncomplicated steps of Western Beauty. Glow Recipe heard from consumers that while they liked the exciting and innovative Korean beauty products, they didn't have the time for a complicated routine. And so, Glow Recipe products were made! Glow Recipe skincare is all vegan-friendly and cruelty-free and this product is formulated without synthetic dyes and mineral oils. 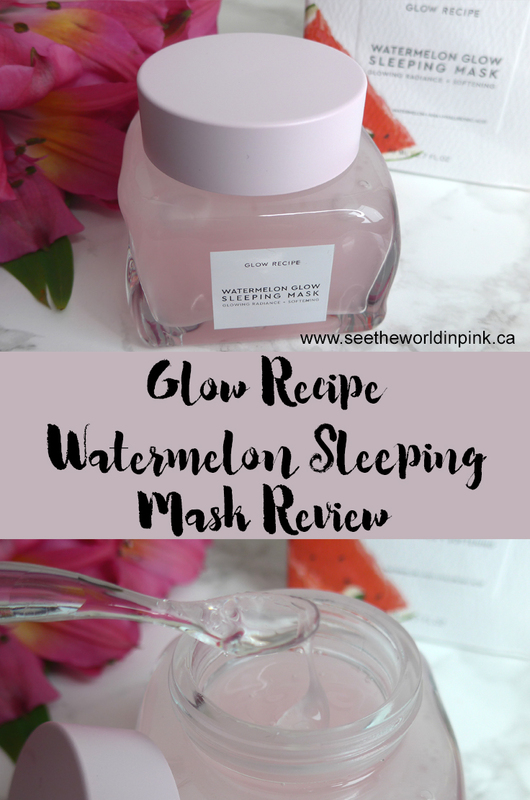 Glow Recipe Watermelon Glow Sleeping Mask ~ $59.00 CAN for full size (there is also a mini for $29.00 CAN). A skin-smoothing, radiance-boosting sleeping mask with watermelon and hyaluronic acid for post-facial results, all in one jar. This overnight mask features watermelon extract to sooth and hydrate, hyaluronic acid to hydrate and plump the skin, AHA to exfoliate and brighten, and peony root to brighten and smooth. It also contains pumpkin, pomegranate, banana and cabbage root extracts and licorice root extract as well, which are all great for the skin. I don't generally use AHA's every night; but, this is supposed to be gentle enough on all skin types to use every night. If you have sensitive skin or haven't tried an AHA product before, maybe just try a couple of times a week for starters, and then work up to more! I personally still use this at least 3-4 times per week for best results. I purchased this mask back in January when I was in Anaheim because the hype around it was real and I really wanted to try it! As an overnight mask, this is easy to use - apply it as the final step in your routine! Use 2 scoops with the little spoon provided with the mask, or a little more if you have drier skin. Pat the product in to your skin (don't rub) and allow it to work overnight - wash off in the morning. You could also use this as a wash off mask if your skin is sensitive or stressed skin - apply a generous layer, leave on for 10 minutes and rinse off with warm water. Keep in mind, the texture of this mask can separate so you take the spoon and stir it up before applying it! It does have an artificial watermelon scent - which I happen to like! I don't find it very strong and it doesn't really linger on the skin. I have been using this mask on and off for a few months. When I first starting using it - between 1 and 3 times per week, I didn't notice that this made a huge difference in my skin. I didn't notice improved brightness at all. Also, it in the winter months when my skin was a little drier, it wasn't quite hydrating enough. But, I think it may be because I wasn't using it frequently enough - I have been using stronger amounts of AHA and glycolic acid on my skin, so I don't think it had the same impact on my skin if I don't use it often enough. I stopped using this for a few weeks, and then started again and using it at least 3 times a week (but up to every night) and I have noticed the results on my skin! Also, my skin is more combination/oily in the Spring and Summer, so I think this has worked better! My skin is brighter, hydrated, and refreshed in the morning after using this! For me, this product is proof that my skincare routine needs new products depending on seasons - this didn't work for me in the Winter; but, is really great for my skin now that it's Summer! If you are interested in trying this product, I'm so excited it is available in Canada! Also, I love that a mini version is available in case you want to give it a test first! I'm excited to try the moisturizer and sheet mask from this line soon!